Well I’m not going to turn down an introduction like that, and I can see why she feels that she is so amazing when you read in her own words. “Who am I? I am busy, just like you. I want to live long and live STRONG, and I don’t want to obsess about it. I don’t want to rely on the expiring resource that is willpower, I want a lifestyle that works. I want my red wine, my dark chocolate, and I still want to bounce a quarter off my abs. But this isn’t a story about a lady who loves springing around, and balancing upside down on her head on surfboards (yep, im sure we will discuss this image later), but one of a hardworking business lady who has constantly upskilled herself and developed since starting her working life like me as a corporate trainer. Funnily enough our Elizabeth Lucas-Averett and my lives also intertwined as she also worked as a consultant for a UK-based firm supporting the Royal Bank of Scotland/Natwest’s customer growth objectives, to whom I worked for both companies in my past too. 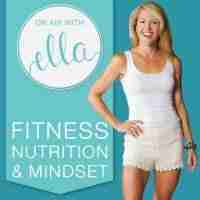 As well as being the host of the wellness based podcast and platform On Air With Ella you can see that she is right and she is super busy. So does she Elizabeth Lucas-Everett have a way of finding more time in the day than anyone else? And does she see her current path as exactly where she should be, or is it still part of the longer journey of life? How you have to start somewhere to get anything done in life, and it really doesn’t matter how old you are when it happens. Simply start and do it now! How the world will keep on handing you opportunity after opportunity, it’s just up to keep on reaching out and grabbing them. Why it is so important to not buy into the scarcity model that stops so many for starting. There is enough sunshine to go around in the world. Go out and get tanned now! If you are going to make an assumption about an outcome then why not make the assumption that it is going to be brilliant. You will be amazed by your results.